A childbirth educator once wondered why a doctor wasn’t 100% sure if a baby was breech or head down. He suggested an ultrasound (sonogram) to verify baby’s position. Breech is sometimes difficult to tell with palpation (feeling the abdomen with the hands), and other times quite easy to tell. Even if the doctor is sure, s/he’ll recommend an ultrasound (sonogram) to get hard data to enter into the mother’s chart. Pregnant parents use this video to improve fetal position (breech, transverse, posterior) You could be one of these parents. There is a brief demo on using the breech tilt and forward-leaning inversion together. We now suggest coming up to a high kneeling position after doing the Forward-leaning Inversion for 30-35 seconds. See more on when and how often to do this and other activities to allow your breech baby to find the room to turn head down themselves or make it easier if the doctor manually turns the baby. Spinning Babies Parent Class video walks you through all first steps we recommend for helping your baby turn head down on their own, or making an external version easier & more successful. Plus, you will learn the Spinning Babies approach using balance, movement, and gravity for comfort in pregnancy and an easier birth. See more about how to Flip a Breech. Ultrasound is a more sure way of telling baby’s position than feeling through the abdomen. Your provider may want you to have a concrete way of knowing your baby’s position to help you make decisions from fact. Some obvious problems may be ruled out. Ultrasound is justified if your care plan will change based upon what was found by an ultrasound examination. But ultrasound itself is not without risk. There is another way to tell baby’s position other than ultrasound imaging, and that is by palpation, or feeling the baby through the abdomen. Palpation is not as reliable as ultrasound. Not all women are easy to palpate. It takes less skill to interpret an ultrasound image of a breech baby than palpate the baby’s position accurately, especially in women that aren’t easy to palpate. Parents may well want to see “proof” of breech presentation as well, to prepare themselves and make choices for childbirth. Finding out that the baby is breech can definitely change birth plans, whether to plan a cesarean or make the necessary preparations, sometimes including travel, to find a safe breech practitioner. Learn more using The Belly Mapping Workbook. There is a section with illustrations on figuring out if your baby is breech (after 30 weeks or so) and what to do about it. Here is a picture of palpation and drawing the findings of the breech presenting baby on a Sunday, when baby was still breech. 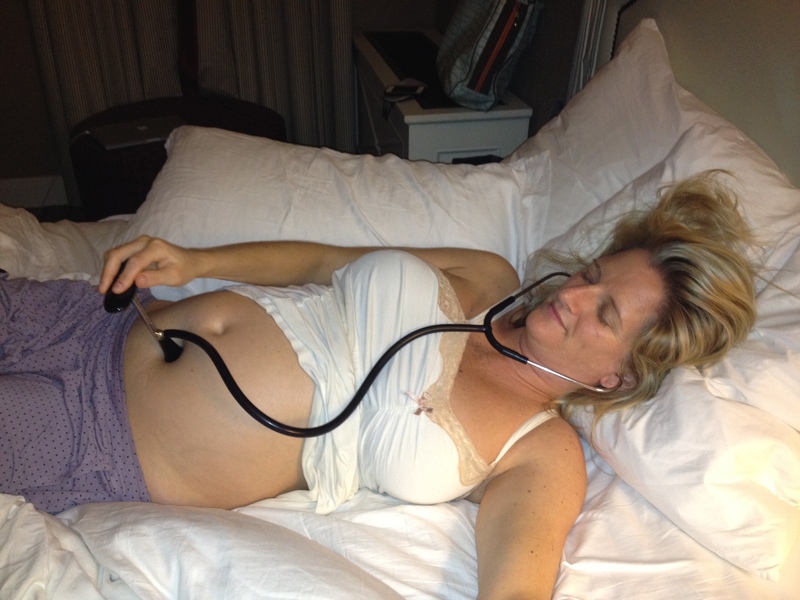 The mom did a forward-leaning inversion that night and the next day, Monday, before her scheduled ultrasound. At the ultrasound appointment, we found out the baby had flipped head down! Gail feels the shapes of the presenting parts of baby. Is it a head or a bottom? With palpation, we look for a cylinder shape coming from the firm bulge at the top of the fundus. This is the thigh coming off of the buttocks. If we find cylinders low in the abdomen and a firm ball at the top, we are considering a possible breech position. Listening with a fetoscope or doppler may be helpful, but not diagnostic. Location of the heartbeat is not a reliable indicator since sound travels through water. Expertise with listening to many babies helps sort out the difference but is still not diagnostic, only another important clue. Sometimes the heartbeat can be heard far from the heart when the physician or midwife uses a doppler. A doppler is a handheld monitor that uses ultrasound (sonogram) to detect the heartbeat. A firm tummy allows the heart rate to be heard a distance away from the baby. So does ample amniotic fluid. Water carries sound. I had one child, breech vaginally. I would not let them do an ultrasound so I escaped the knife. -Dr. Lucia Lein, DC, about her own birth which occurred too quickly for a cesarean to be done in labor. The drawings begin with the four quadrants of a belly map. 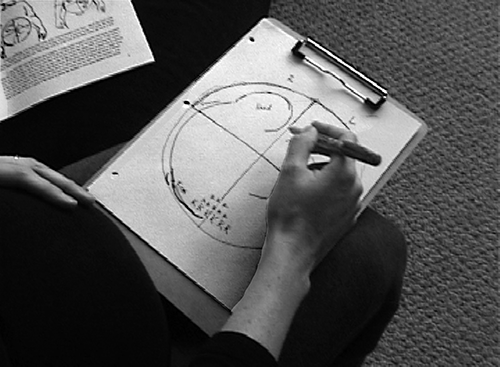 A simple circle can be drawn on a piece of paper. Then draw two crossing lines; the lines cross at the navel. Next, the bumps and wiggles that the mother with a breech might feel when she is lying down are drawn on the map. When the feet are folded near the baby’s buttocks the pelvis and feet together make a hard ball. Feeling the folded feet and hips of the baby through the abdominal muscles and uterus can, at times, feel much like a head. The head, however, tilts on the neck when moved by hand. Grasping and tipping the buttocks will move the entire trunk of the baby. Sometimes the uterus over the fetal head in the fundus (top of uterus) feels warm and tender. When the baby is stretching a leg away from his body, the hips will have a cylinder shape emerging from it — the thigh. The head doesn’t have a cylinder coming out of it. There may, at times, be a cylinder shape overlapping the head, when the baby has their arm up. Sometimes fingers can be felt near the face. Lower in the pelvis, the foot movement of a breech is quite memorable. One mother said, “The baby has made a treadmill of my bladder.” Compare that to the Frank breech position the legs are up towards the tummy and chest and there is little movement from the feet in the lower part of the abdomen. A transverse baby will lay sideways. Nothing will be in the pelvis. 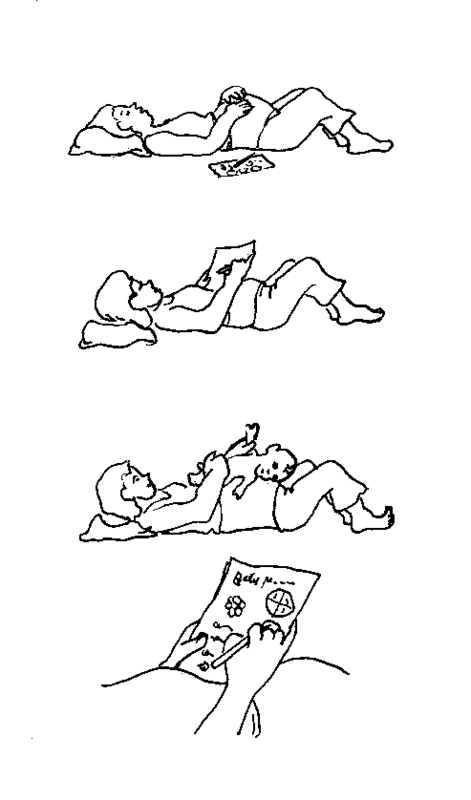 Limbs will cross the belly, high or low or right across, depending on how the baby is lying. The limbs might even be towards the back which would make the baby seem less active. The bottom and head will still slide against the mother’s abdomen on a regular basis, reassuring everyone with the baby’s wellbeing. The doctor won’t do a cesarean for a head down baby s/he mistook for a breech. And, if the parents desire a vaginal breech birth, a sonogram can locate the placenta, check for head flexion and help the parents and physician predict what type of breech position the baby may be in once labor begins. The legs can change position in early labor, so the actual position is not for sure until the baby is coming through the pelvis in the pushing stage of labor. Even some ultrasound technicians are not accurate at telling the finer details of fetal position, so parents should ask, if they decide on an ultrasound, to have the baby’s position explained to them in detail. Baby’s weight (not always accurate, but we want the head and body to be in the same proportion rather than having the baby’s head much bigger than usual for the size of the body a baby has. If the full term baby’s frank breech bottom fits, we expect the head to fit, but it must be flexed chin down). When a breech position is suspected using the maternal Forward-Leaning Inversion and Breech Tilt exercise can help the baby flip head down. 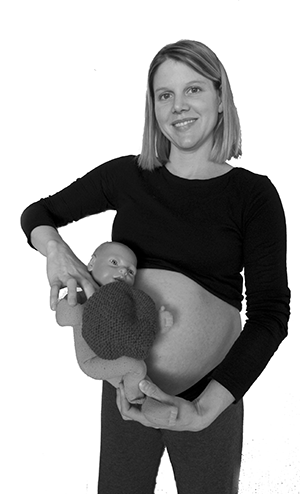 Read more about what to do for a breech baby in pregnancy in When Is Breech An Issue?. 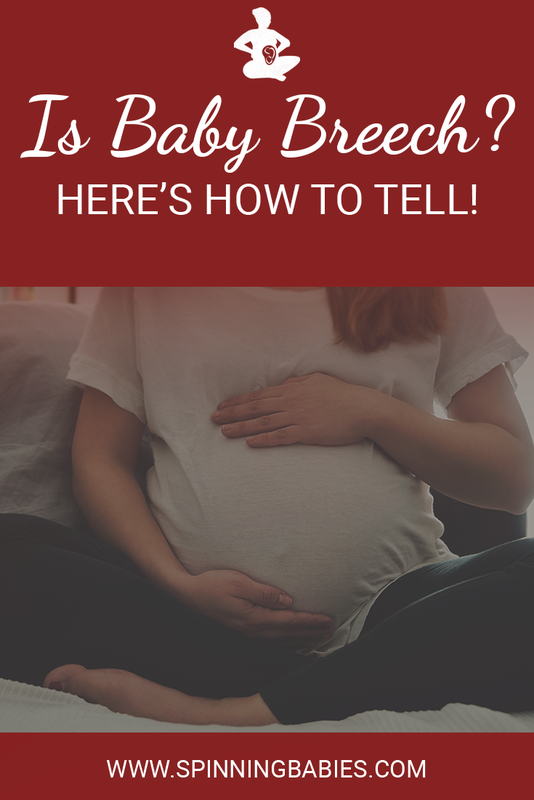 For a lot about breech read Breech.